How do I filter conversations as a student? 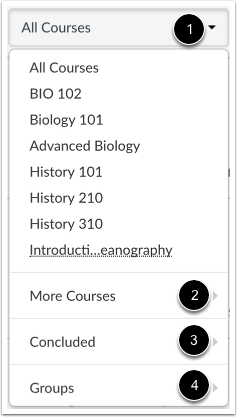 You can filter the conversations in your Inbox for easier organization, especially if you are enrolled in multiple courses. Filtering conversations allows you to selectively view conversation messages by course, inbox, or user. You can also filter by Inbox type. By default, Conversations displays everything in your inbox. The Unread filter displays all unread conversations in your inbox. 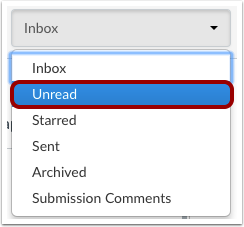 Learn how to view and manage unread messages. The Starred filter displays all starred messages in your inbox. Starred messages are marked as important so you can locate them later. Learn how to star a message. 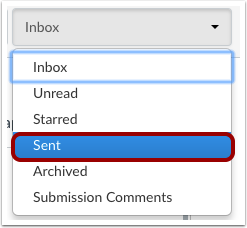 The Sent filter displays all your sent messages, both to individual users or multiple users. Note: The Sent filter only includes sent messages from the first user to send a message in a Conversation thread. 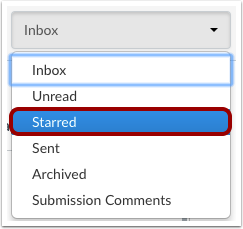 Replies from recipients of the original message will appear in their Inboxes, but not in their Sent filters. The Archived filter displays all archived conversations. 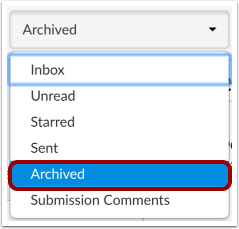 Learn how to archive a conversation. Note: Sent messages cannot be archived. Additionally, archived messages do not include deleted messages, which are completely removed from Conversations. 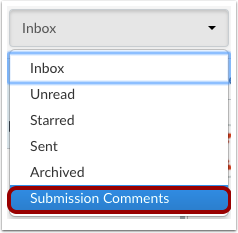 The Submission Comments filter displays all comments associated with course assignments and feedback. Learn how to reply to submission comments. To filter by user, type the name of a user in the filter field , or browse for the course, group, or user by selecting the Address Book icon . Previous Topic:How do I find my unread messages in Conversations as a student? Next Topic:How do I star a conversation as a student? Table of Contents > Conversations > How do I filter conversations as a student?